Bootie NYC @ LPR: Britney vs. Taylor Mashup Night! New York City Bootie NYC @ LPR: Britney vs. Taylor Mashup Night! 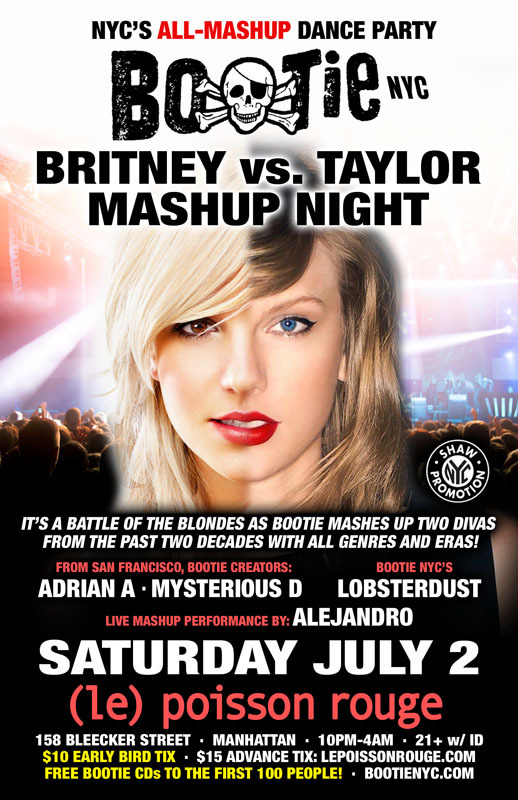 Bootie NYC returns to Manhattan for the Saturday of 4th of July weekend, to pay mashup tribute in a battle of the blondes -- it’s Britney vs. Taylor Mashup Night! Two of your favorite dueling divas, mashed up with anyone and everyone -- no era or genre is safe! Bootie NYC pays tribute to two of today’s modern divas, by having them battle it out at the club for mashup pop supremacy – it’s Britney vs. Taylor! We’ll be spinning the greatest songs Britney Spears and Taylor Swift have ever created, and giving them the Bootie treatment, mashing them up with anybody and everybody to create brand-new songs that you’ve almost, but not quite, never heard before! Direct from San Francisco will be Bootie creators and DJs Adrian A and Mysterious D, joined by Bootie NYC’s own Lobsterdust, as they keep the dance floor moving late into the night with all the best mashups in the universe. Plus, there will be live vocal mashup performances from Alejandro and Adrian A, along with FREE Bootie mashup CDs to the first 100 people through the door!